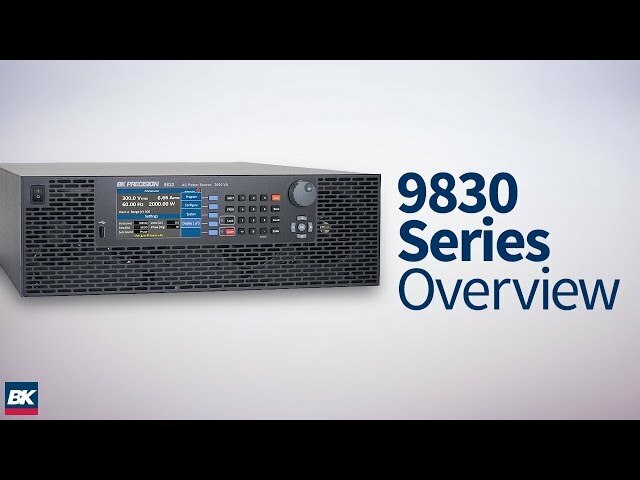 The 9830 Series programmable AC power sources provide high performance and low total harmonic distortion in a 3U form factor. The addition of positive and negative DC offset voltages expands the AC capabilities to operate in DC and AC+DC output coupling modes. The user can select built-in and user-defined harmonic waveforms or select from standard sine, square or clipped sine outputs. The high output current crest factor and low input resistance are suitable for high inrush current measurements when evaluating capacitive or inductive loads. Accuracy Voltage AC 0.2 % + 0.2 % F.S. DC 0.2 % + 0.4 % F.S. 4 - 150 VAC (150 V range) and 300 VAC (300 V range) with nominal input AC voltage. Accuracy Voltage AC 0.25 % + 0.25 % F.S. DC 0.25 % + 0.5 % F.S.